With a string of installments that have been pretty strong more recently in the Chronicles of Narnia, I went into The Silver Chair with somewhat decent expectations. I mean, it didn't include any of the Pevensies this time, but it was still continuing the part of the series that I've found most rewarding, so the verdict should be a pretty good one, right? The Silver Chair starts off with our protagonists Eustace, introduced in The Voyage of the Dawn Treader, and his school-friend Jill as they try to hide from some bullies. Attempting to escape through a door in the schoolyard wall, they find themselves transported to Narnia. Charged by Aslan to find the missing son of King Caspian, they find themselves facing temptation on all sides as they attempt to stick to the strict instructions given to them. Let me say before I continue that The Silver Chair is a perfectly enjoyable book. The characters are well-written and the adventure is very well-crafted with a fantastic final confrontation with the villain of the piece. With that in mind, I came to a realisation that is possibly true of the preceding installments in the Chronicles of Narnia, but is especially evident here. The humans really don't do a great deal of good here. See, they're given four instructions to carry out by Aslan, all of which will make their job of rescuing the prince that bit easier, but all Eustace and Jill really manage to do is get distracted by temptation whenever it turns out that this whole adventuring lark might get a bit unpleasant at points. Honestly, if it had just been the two of them, I don't think they'd have even gotten started on their journey. 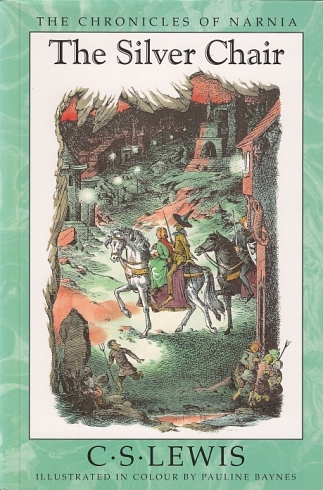 As it was, I think the unsung hero of this book is Puddleglum, the Marsh-wiggle who is tasked with guiding them to their destination in the Wild Lands of the North. With his gleefully pessimistic demeanour and focus on how everything could go wrong at any time, he's pretty much the only thing that keeps the party on track at all. While he's no Reepicheep, he was a breath of fresh air compared to the bumblings that the human children bring to the proceedings. Now, while I reiterate that I still really like The Silver Chair, I now find myself questioning it. If the children brought to Narnia fail to contribute to the plot, then what purpose do they actually serve? I mean, I suppose the obvious answer would be that this is meant to be a narrative about how things that are clear in principle can be muddy when applied to real life, or about how easy it is to fall to temptation. And in theory I can accept that. But while I do accept that there's probably a thematic reason for the children being so useless, there is a part of me wondering what it would be like to have a book with Reepicheep and Puddleglum as the main adventurers. Now that there is an absurd scenario that I would love to see.